Father* Hope Tigner Culpepper D.D.S. From QRZ.com: Amateur Radio License W4HD Boyd D Culpepper, Fountain Inn, SC. Obituary of Boyd D. Culpepper, published in the Greenville News on 24 Jul 2017. E-mail written 4 Jul 2011 to Warren Culpepper from Boyd D. Culpepper (#35827), e-mail address. From QRZ.com: Amateur Radio License KA4HYD Joe Ann F Culpepper, Fountain Inn, SC. In addition to Thurzia Ann Phagans, Reuben and Elizabeth Phagans had a daughter, Amanda "Mandy" Phagans, b. Jun 1868, d. 1913, buried at Airline Baptist Cemetery with her husband, Minor Surveyor "Sevier" Norris. Minor was b. 5-12-1874 and d. 11-23-1950. Amanda and Minor had a daughter, Fannie Rhoda Norris. 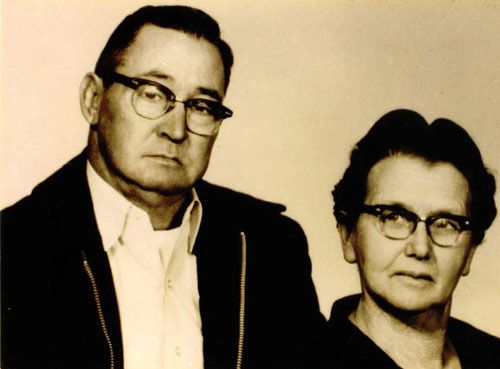 Fannie married John Moses Jackson and they had a daughter, Mary Lou Jackson. World War II Service: Curtis D. Culpepper, 8929086. Enlisted from Greenville, Greenville Co., SC for active duty in the US Navy on 5 Aug 1943. Awards: ACM APCM 1S/S, WWIIVM. Honorably discharged as a SM2C from the USS LCI 814 on 20 Apr 1946. He served two years in Viet Nam and brought home a Purple Heart and other awards. E-mail written July 2005 to Warren Culpepper from Michael Denson Culpepper, e-mail address. E-mail written April 2006 to Warren Culpepper from Stephen Lamar Culpepper (#35838), Fountain Inn, SC, e-mail address. James [Henry] Culpepper, 1 M26-45, 3 F0-10, 1 F16-26. E-mail written 1999 to Lew Griffin from Thelma Marie Long. Daughters of the American Colonists, Colonial and Genealogical Records, , 1969. James H. Culpepper, 1 M10-15, 1 M40-50, 2 F5-10, 1 F20-30, 0 slaves. The Grace families were from Guilford, NC, they were in the counties of Ballard, Hickman, Hopkins, Henderson and Christian. Elkanah Grace Jr. married Martha Culpepper in Muhlenberg Co Ky, June 2, 1826, migrated to Hopkins, Christian and Ballard Ky, then to Denton Co TX. in 1854. Martha Balentine died Oct. 15, 1863 in Denton Co TX. Elkanah Grace Jr. and Martha "Patsy" Balentine Culpeper married June 8, 1826, but according to the Muhlenberg County Kentucky Marriage Register certificate number 760, has the marriage listed as 1836 but certificate numbers 761 and 762 is listed as 1826. They were married by the same W. Oates, that married certificate # 761. So I think someone made a mistake and put 1836. Martha's Bible says 1826. Elkanah and Martha moved to Hickman County in 1829 along with his parents, brothers, sisters and their families. Also a James Culpepper is listed in the 1830 census for Hickman Co.
1840 census shows Elkanah and Martha in McCracken Co. In 1851 Ballard County Ky was formed out of McCracken and Hickman. Elkanah shows up last on the Ballard County Tax List in 1852. Elkanah received 160 acres of land in Denton County TX Nov. 16, 1859. By 1860 enumeration time Denton County, TX . Mrs. Elizabeth Culpepper, aged 92 years, maiden name Sweeney died 22 November 1872 at the residence of Elder L.M. Edgar in Henry County (Tenn) married in 1832 somewhere near Nashville. No known relatives nearby. "Paris Intelligencer 28 Nov 1872." E-mail written 2000 to Lew Griffin from Dennis Morgan.